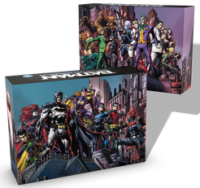 Batman™: Gotham City Chronicles is a scenario-based miniatures board game where 2 to 4 players control the Dark Knight and his allies in their never-ending battle against crime through an asymmetrical and open game system. The game involves two opposing sides: the heroes and the villain. We wanted to represent that dynamic up front by making it obvious from the art on the boxes. That's right, boxes, because one box will not be enough to fit everything you will get. But this separation has another purpose: it eases the setup of the game. The hero box contains the hero boards, screens, cards...everything the heroes need to play a scenario. The villain box contains the miniatures, tiles, dice, and everything needed to prepare the command board for the fight to come. These 2 boxes will constitute the core game, which include all the base offerings plus all the Stretch Goals we're hoping will be unlocked during the campaign. Add a Review for "Batman: Gotham City Chronicles"